The first row of an afghan with homespun or bouclé or other knobby style yarn can be frustrating. This afghan does not require finding chain stitches, even for the first row. This pattern was designed to be easy for homespun or bouclé style yarns, but it can be made with just about any yarn. Make it in a solid color or with as many color changes as you like. It is quick to make and shows the ripple pattern of a self striping yarn. The example is made in Sensations Rainbow Boucle. This blanket can be made any size. Five widths are given in the directions. Instead of a beginning chain, the blanket is begun with a first row of chain and tr spaces. There is also a tutorial video for this afghan and a chart. Row 1: Chain 3. Tr in first chain. This forms the first chain and tr space. Form each additional space by chaining 3 and doing a tr on the tr of the prior space. Make a number of chain and tr spaces that is a multiple of 6 plus 1. Do not turn. Row 2: Ch 5. Without turning the work, rotate so that the following is worked across the tr created in the first row. Over first tr work 3 dc. Work 3 dc over each of the next two tr. Skip one tr. Work 3 dc over each of the next two tr. ** Over the next tr work 3 dc, ch 3, 3 dc. Work 3 dc over each of the next two tr. Skip one tr. Work 3 dc over each of the next two tr. Repeat from ** to end of row. Over the last tr work 3 dc, ch 2, dc. Row 3: Ch 5 and turn. Work 3 dc in the ch-2 sp. (Skip 3 dc and work 3 dc in the space between that dc and the next one) two times. Skip 6 dc. (Work 3 dc in the space between that dc and the next one, skip 3 dc) two times. **Work (3 dc, ch 3, 3 dc) in the ch-3 sp. (Skip 3 dc and work 3 dc in the space between that dc and the next one) two times. Skip 6 dc. (Work 3 dc in the space between that dc and the next one, skip 3 dc) two times. Repeat from ** to end of row. Work (3 dc, ch 2, dc) in ch-5 sp. Repeat Row 3 until blanket is length desired. Alternate edging for bottom and sides – at end of last row, instead of ch 2 and 1 dc, make ch 3 and 3 dc. Continue down side making 3 dc in each loop. In first loop of bottom, make 3 dc, ch 3, 3 dc. 3 dc in each of next two loops, (3 dc, ch 3, 3 dc) in next loop, 3 dc in each of next two loops, skip a loop, 3 dc in each of next two loops, (3 dc, ch 3, 3 dc) in next loop, 3 dc in each of the next two loops, (3 dc, ch 3, 3 dc) in last loop of the bottom. 3 dc in each loop of the side. Finish off and weave in end. DON`T SEE HOW THIS CAN BE LABELED EASY.CANNOT UNDERSTAND INSTRUCTIONS,AND I HAVE A COLLEGE EDUCATION! Is there something in particular in the instructions I can help clarify? I am not understanding it either? I get chaining 3 then I do a tr into the first chain. This puts me back at the beginning?? If I do another chain 3 I will be going in the opposite direction. Any help on this would be great. I like the afghan. I made a tutorial video which I hope will clarify the pattern. Thanks so much for the video. I am a visual learner and I now see what you ment and the directions are very clear and easy. I am off to make it now. I’m with Enerod; the visual aid was perfect in helping me understand the written pattern. Thank you for including the video – it quickly cleared up all of my questions as I read through the pattern. Great job, Mama! D J Hixson, Please give this another try. I have a college education as well and I gave it a try and it worked perfectly. If you put the hook bak into the first ch of the 3 each time the treble takes you right up to the third ch , not back to the beginning. Calm down and try it again. Just because you have a college education doesn’t make you right…but that college education should help you proof your writing. Really you can’t understand it? I don’t haven’t been to collage yet I can understand it perfectly. Maybe it’s not that pattern you’re have problems with but English. Because for someone with so high of an education you don’t seem to understand to understand the ALL CAPS is RUDE, you do need spaces between words & sentences, and that your first two sentences should have started with I. There are many forms of rude other than using all caps, and belittling some one is just as rude. All caps can be frustration. When one of us doesn’t understand a pattern we need to be gentle and kind and share our knowledge. DJ, when I first worked an afghan using this technique I had a hard time visualizing how it would work, but once I actually did it, I realized that the finished treble in the first chain brought me back up to the same height as the 3 chains, and I could make the next 3 chains in the same direction. Once you get the hang of it, it is quite easy to work, especially with the knobby yarns. Good luck and keep crocheting! DJ Like Enerod said I too am a viual person. The tutoriol is very helpful. A college degree has nothing to due with crochet patterns. I agree with Marian. No need to send a msg when you are totally frustrated. There is also no call for badgering others. Marian I’m sorry but belittling someone that has a college education that doesn’t understand a crochet pattern is not the appropriate thing to do. People learn differently some are visual…I need someone to show me and then I don’t forget. I can’t read a pattern but have made some very nice blankets and hats and scarves. A suggestion I might make to you is that you calm down and edit what you write cause there are a lot of mistakes in your reply. College Education has nothing to do with it. The video explains it all. The directions are a bit messed up. I also have problems understanding pattern instructions, but the video made it easy. I just finished this blanket and it was the first time I have ever read crochet instructions…. I found this pattern Very Easy to understand! Thank you ! I think if you watch the video carefully it will be very helpful. I am very happy to find a way to not have to make a very long chain to begin a project. Keeping the chain straight and getting the first row in is always the hardest part for me. I love this. This was really easy??? Chain 3 TR in third chain, chain 3 TR in the space of last Triple and chain 3!! Thank you so much for posting this pattern and the video, I have been looking for a ripple pattern and I am excited to try this with some of the knobby yarn I have acquired!!! Love it, Love it… great start to a ripple-ghan, I always hate it when I can’t get the last row to look the same as the frist. This pattern solves that problem. Thank you for the pattern and video. I started one and it is fast and fun. Thanks! I have made the no beginning chain afghans before and I love it. Really is very easy and I love the way it looks. I love this pattern! have been looking for something easy to work some soft but difficult yarn and this is perfect!! thanks! Where might I find additional patterns for no beginning chain afghans. I have been away from the hobby for a while and now that I am retired, I want to get back to the fun. Thanks. Did you see the several I have? Thank you so much for sharing your patterns and techniques. Also your videos were very helpful as I’m the visual type person. It’s great to see patterns that don’t have you chaining hundreds of chains only to get twisted. I love this pattern and want to try it with a fade, like holding two strands of color A together for a row then one of A and one of B for the next row, then two of B so on and so forth. do you see any reason why this would not work? That should work very well and be a beautiful affect. love the fade idea! Can’t wait to try it, too! Yeah thank you. I just received a bunch of yarn that belonged to my grandfather who recently passed away. I wanted to do something like the fade you mentioned but did not have any idea how. Now I know what I need to do to get the look I want! Yippee I can’t wait to get started on this pattern and your fade idea. THANK YOU! also can you give an estimate of how many rows you did for the longest one? About 95 rows. There are about 7 rows per 5 inches of length. My sister sent this to me after showing me pics of the ones she made. I have been trying for several years to make a ripple blanket. Thanks for the video!! Can’t wait to get started!! In round 3 it says to skip 6 double crotchets in 2 different places. Is that correct? It seems to make a huge hole! Yes. You skip 6 dc at each “valley” of the ripple. or having left over chain. Now I can use the beautiful chunky yarn I couldn’t resist! And I can’t wait to try some of the other patterns. Thank you again! This looks beautiful. Could I possibly get the instructions, measurements and amounts of yarn for an 80″ by 72″ blanket. This would be for a king size bed throw or coverlet. Thanks so much. Start with 85 loops. This will take 46 oz/3,550 yrds of yarn. Hi Mama, God Bless You, your video instruction is really helpful. I am sort of practicing making this because I want to make a really nice large one for my son and daughter-in-law but right now I am practicing with some very thick cotton yarn with a J hook and it looks awesome. It’s in the next to the last paragraph that starts with “Alternate edging for bottom and sides”. I need help. Somewhere along the line I got messed up. I am practicing on some cotton and polyester thick yarn, no problem there, but my highs (peaks) and valleys (lows) got mixed up. I started with 37 no chain beginning, I followed you, I thought, on the video but it’s not coming out right. Can you give me any help without actually seeing it? I really would like to make one of these for my son and daughter-in-law, as I stated earlier. I have made this type of afghan before, a long time ago. Of course, it was not the no beginning chain, this is the first time I have seen that. Thanks so much for your time. Going back along your beginning loops, if the first one is numbered 1, then on your second row you should have “valleys” formed by skipped loops for loops 4, 10, 16, 22, 28 and 34. You should have “peaks” formed by having (3 dc, 3 ch, 3 dc) in a loop in loops 7, 13, 19, 25 and 31. Could you please tell me what yarn you used for this project? can I use red heart yarn for this pattern? Sorry, I haven’t made any of those. You are such a sweetheart for making a video for this pattern. I saw the pattern on Ravelry, followed the link over here to your blog and when I saw all the early comments on difficulties I just went over and watched the video, which is most excellent by the way! I just wanted to say thank you for taking all the time and trouble to share your beautiful pattern with us! Thank you Mama for some more new patterns. I have done so many of your patterns and they are beautiful. You are a blessing. Thank you so much for this pattern!! I have made the most amazing soft wonderful afghan and it was so easy! I worked on it for a few months, but when I wouldnt have time to crochet, it was super easy to pick up and start where I left off!!! I went straight for the video and appreciated it very much. I thought your tone of voice and the amount of time spent were very soothing and confidence-building. Makes me want to go buy some bulky yarn and pick up my hooks again!! Thank you for the written instructions, too. This is actually the first thing I have crocheted ever. I know, pretty ambitious, but the instructions with the video made everything so clear. I didn’t think I would be able to make something like this on my first go, but then my “sample” became an afghan. Thanks so much!!! Thank you so much for this pattern. I like to do Granny patterns because of not having to find the chains and have not tried any of the knobby style yarns because I couldn’t imagine trying to find the chains. Again thank you. The edging over the bottom is very similar to the row repeated throughout the blanket. Since it is going across the bottom and therefore the opposite direction of the rest of the blanket, the “peaks” and “valleys” aren’t at the same places. For the bottom edging, (3dc, 3ch, 3dc) are worked on the loop on either end to go around the corner. 3dc are made in each loop except that the “valley” loops are skipped and the “peak” loops get a (3dc, 3ch, 3dc). This is very easy to learn, if any one does have a problem they need to follow the video….very easy to understand and quick to follow. I love your pattern. I am a self taught crocheter that has always made afghans for charity or gifts to other people. I have always been intimidated by the Boucle yarn and have tried it on a few projects to a train wreck of results. I am excited to try this pattern. It should work beautifully with the suggested yarn. Thank you so much. I love the look and feel of the yarn but have always had difficulties working with it. Your pattern is perfect for it. 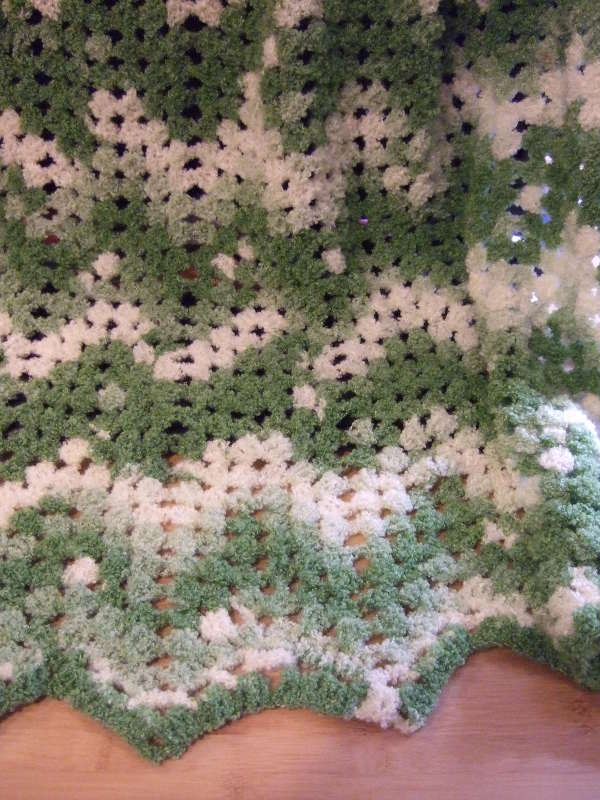 I’m new to crochet and was looking for a simple ripple pattern to make an afghan for a tottler ( turning 2 in the fall). Need to use a soft yarn like Bernet baby blanket and this looks like the perfect pattern. Practicing with worsted yarn and seems to be working well for me. The video was very helpful between that and my How to Crochet book ! Thanks for making this pattern available (and free) and for making a tutorial video, too! Very generous and kind of you. Love the pattern and hope to give it a try. It will be my first crochet project. I have some Homespun yarn i was going to give away because i just can’t work with it. I couldn’t see the chain stitches and my eyes were going crazy. I will try it with your pattern. This pattern is beautiful, i can’t wait to get started. Thank you for this pattern!! Can this afghan be made in worsted weight yarn? Yes. It will work with just about any type and any weight yarn. Just use a hook that is appropriate for the yarn, usually what is recommended on the label. i always lost count chaining and would end up having to start over after a few rows when my counting error would show up in the pattern. after chaining 108 or more sometimes, frustration would set in and project rejected. not anymore. this is the first pattern i have seen with this method. thank you. how did you even figure this out!! i am amazed! Wow..I really enjoyed doing this pattern. It took me a while but after watching the video…many many times…start, pause, start again…finally managed to tackle it. I’ve been practicing on just some extra yarn I had…just to make sure I could do it before I purchase my new yarn for this lovely pattern. What good timing because my local Fabric Depot is having a 30 percent off on all purchases…just hope it’s on the yarn I would like to use. I think I’ve been doing something wrong. The sides of the afghan are shaping into a ‘V’. Shouldn’t the sides be straight up and down. Please help I really like the pattern. In the repeated row (row 3) there are two places that say “skip 6 dc”. What that does is skip two of the little blocks and doesn’t make a block in the space between those two. By skipping those spaces, that creates the decrease that counteracts the increase you are making at each of your peaks. Since you haven’t been making those decreases, your blankets rows are getting longer as you go. I only offer my patterns for free on my web site. I am making this granny square chevron 31 inch baby afghan. I have finished the first two rows and am on the third row. I changed colors and am at the end of the row and don’t know how to turn when I got to the end of the tow. Where can I get the directions . Please and thank you. I give the turning directions at the beginning of row three. You will chain 5 and turn. I have always avoided ripple afghans because of the long chain required to start, I would always lose count. This pattern made it easy. Thanks for posting it. This is freaking awesome! THANK YOU! LOVE THIS! I’m going to try this out with the Bernat Pipsqueaks yarn, that yarn is completely cute and I couldn’t resist buying it in multiple colors because it’s so soft for baby blankets but it’s impossible to crochet into a chain because it’s so fuzzy! Thank you! Video is great! Makes everything very understandable. Now to attack all that homespun yarn stash! Very easy to follow. Especially if you watch the video. Thank you for the patteren. I am southern, so don’t hold the wrong spellin’ against me. This is a wonderful pattern. Works up FAST! I love it and I love the easy beginning row. This will be a go to pattern that I will use often for gifts. I have always wanted to try a ripple pattern but never got around to it. I saw this pattern and gave it a try. Very easy to follow and the video helped to make sure I was following directions. Thanks so much for sharing this great pattern. I absolutely love the no beginning chain method and your youtube makes it so clear. I made this afghan in a size for a wheelchair bound person. Turned out beautifully! Thank you for the size charts, especially. I used this pattern recently to make an afghan for a preteen. It was perfect for the heavier weight yarn I was using and turned out beautifully. I love your way of writing instructions. I especially liked the new take on a foundation row – so much easier for heavier yarn! My learning style is by following written instructions rather than watching, so I am a new fan of yours. I have recommended your site to others. I am a visual learner and beginner at crochet thanks to youtube. I’ve made several scarfs using different crochet stitches and my afghans have been a continuos granny square. My biggest problem with other afghans was counting the stitches. I came upon your video of the no beggining chain Granny Ripple and it was so easy to follow. I just completed a large blanket for my Grand Daughter, in lavender, white and pink.and finished it with the edging you provided. It is beautiful. I will be trying your other no chain patterns. Thank you so much for sharing this technique. Thank you very much for giving access to this pattern and the very helpful video. There’s nothing so satisfying as being able to master another technique, on this occassion, in crotchet. Being English, I also had to convert the pattern to UK terminology and enjoyed the challenge. I look forward to making blankets for my twin grandsons, expected in September. Look forward to following some of your other patterns. I just want to say I love this. After watching your video the pattern makes so much more sense! I tried watching other video’s and got so confused! Thank you for making it and for making the beautiful afghan! Thank you so much for providing a beautiful pattern and a very clear & concise video…it is so nice of you to do this! You have a very calm and beautiful way about you. Thank you so much, I love this pattern! Thank you very much for sharing. Your video tutorial is really clear. Your help is very much appreciated! I am working on the x-large no beginning chain granny ripple afghan. I have noticed that on row 1 that some of the bottom chains are curling up where my valleys are. Is this normal? That can happen depending on the yarn. If you do add a border, that will fix it. If you don’t add a border, once the afghan is completed you can try dampening those areas and letting them dry flat. I have no college education,dumb as a post, a lot of people ask me how I can do my repetitive process job. I am making this afghan, I watched the tutorial. It is a beautiful afghan and I impress anyone I show. Thank you Mama. This pattern rocks. Simple to follow and so much easier than the standard ripple. Thank you so much for creating a much easier way to do a ripple. Love it and passing the link on to many. The edge will angle since this is a ripple pattern. As long as the edges don’t “grow”, it will work out so that the blanket will be a consistent width when you are done. Thank you so much for your speedy reply – but, “grow” is exactly what it APPEARS to be doing, at least for the first four rows (as far as I’ve gone with it). I have checked and counted and re-checked and re-counted, and I appear to be following the pattern correctly. I think I will just keep going for a few more rows, and see what happens… LOVE this “no-chain” concept though!!! I will be doing many more of your patterns! thank you. I have always loved the afghans with waves but never been able to get one to work. I have had no problems with your pattern easy to understand and I love the look . Love the “no beginning ” chain. I am having difficulty with row 3. Is there a tutorial for that? I finally made it through row 2. I am a beginner at this. Thanks so much for the pattern though. I think I can get through this. Have you watched the video? It has the third row. I love this pattern. I have used it to make curtains out of white cotton yarn for my neighbor. I am an experienced crocheter and found this “hack” to be so easy! I am going to teach it to several of my friends who are novices. I love not having to count until I think my beginning chain is wide enough to be sure I have 6+1. Once that first row is in, you can make great time. Thanks for the fabulous tips!! I, too, became frustrated trying to work in a chain with boucle yarn when I worked over the first 2 strands of the chain, so I tried to stay away from boucle yarn. Then I tried the chain-free method which made the job easy. But one day I made a chain without thinking about it and didn’t want to tear it out. I discovered that if I actually put my single crochet stitches around just the top loop of each chain, I had no difficulty with the stitches coming out right — no hunt and hope, just good placement. As a matter of fact, I just finished a Christmas scarf using this technique and had no problem getting started. See if it works for you. Just remember, there are 3 strands to each chain — two in front and one in back. Work only in the top front strand when using boucle yarn. It works for me. I love this pattern. I had to look at the video as well. This is good for people with poor vision, tendonitis. It’s quick. After I finish this one I’m going to try another. Loving it. Thank you for sharing. This is brilliant! So happy I’ve been able to make a ripple blanket. I used worsted yarn and it looks amazing. Thank you for taking the time to write the pattern and make a video. I have tried ripples so many times. Could never get them right. I gave up. ( Like when I couldn’t make socks on Dps and found Magic loop method.) Along came you. Hurry! Thank you so much! Foundation row excellent idea – saves all that twisting and counting loops. Excellent video as well. I’ve added an extra block of 3tr (I’m Welsh so I’ve had to convert from American dc!) to each zig and zag (ie 8 blocks per repeat pattern instead of 6) to make each ripple slightly longer. I also added extra groups of 8 for the foundation to make it wider. I am using shaded DK wool, in three different coloured balls from the same family of colours. So I hope it will end up with all different blended shades. I lOvE this pattern..I’m just learning to crochet and found the video demonstration a wonderful compliment to the written instructions provided. Thanks for your time and the FREE pattern. Love your Granny Ripple Afghan instructions. Very easy to follow. Made up my own color scheme in each granddaughter’s favorite colors.Only 3 colors. Example: Green Bay; White; green/white twist; white;Green Bay. 3 rows each, repeated 4 times. Approx. 22 skeins. I made 3 queen size using Lion Brand Hometown USA. I averaged about 3 hours a day between Oct 10th & Dec.7th, 2014. They really do work up quickly. Now I have another question. I need a Wedding afghan crochet pattern, King size, for Sept. I would use a worsted weight yarn. Do you have suggestions? Perhaps like the vintage Wedding Ring or? Thank you for being so generous with your lovely patterns. I really don’t have suggestions. I always try to make something in the home style of the recipient. Maybe some of my readers will suggest some of their favorite go-to patterns for wedding gifts. Begin with a chain that is a multiple of 18 + 7. Row 1: 3 dc in the 6th ch from hook. (Skip 2 ch, 3 dc in next ch) two times, skip 5 ch, 3 dc in next ch, skip 2 ch, 3 dc in next ch. **Skip 1 ch, 3 dc in next ch, ch 3, skip 1 ch, 3 dc in next ch, skip 1 ch, 3 dc in next ch, skip 2 ch, 3 dc in next ch, skip 5 ch, 3 dc in next ch, skip 2 ch, 3 dc in next ch. Repeat from ** to the last 4 ch. Skip 2 ch, 3 dc in next ch, ch 2, dc in last ch. After this do row 3 and repeat it as many times as you want for the length blanket you want. Final Row: Ch 3 and turn. (Skip 3 dc and sc in the space between that dc and the next one, ch 3) two times. Skip 6 dc. (Sc in the space between that dc and the next one, ch 3, skip 3 dc) two times. **Sc in ch-3 space, ch 3, sc in ch-3 space, ch 3 (Skip 3 dc and sc in the space between that dc and the next one, ch 3) two times. Skip 6 dc. (Sc in the space between that dc and the next one, ch 3, skip 3 dc) two times. Repeat from ** to end of row. Sc in ch-5 sp. Finish off and weave in end. I have done all sorts of shapes using the granny stitch, but never heard of a granny ripple until today. I Can’t wait to try it. I LOVE how this is started- what a great idea and no having to count chains!!! Pattern was easy to read and follow. I did make a mistake and had to tear it out but that’s because I read too fast and think I know where it’s going as I’m working. When I take the time to Read all the instructions then work- it goes much better. Ha- I do the same when assembling things too. Thanks again- first ripple project and so far it’s looking great!! I just found this pattern and after watching your video it made it so easy to follow. Have a bunch of left overs from other projects so that is what I’m going to try. A friend makes afghans for the Vets hospital and this should be an easy one for her. Good work!! Could you put together a video on how to finish the blanket? I will add this to my list. I currently don’t have a setup for making videos and don’t know when I will making them again. I don’t have a college education, but I understand crochet-speak, and I can watch the video, so I “got it” quickly. don’t work with heavily textured yarns, but will make this with simple worsted weight. Love the way the whole thing looks, and thank you for generously sharing your pattern and instructions. After starting with the no beginning chain, can I then change the pattern? Sure. There are several that start the same way. Thanks so much for the video! I’m another one of those who can’t do by reading….I need to SEE!! I’ve finally mastered the granny square and am ready to branch out. this might be the place to start. Thanks again. Mama, first, I’d like to say thank you for all that you do! Your pattern & starting method are fabulous! Not universal but many patterns can be slightly modified to work with the no beginning chain. Although the 3ch/tr is four stitches, the curve shape makes it more equivalent to three chains. It’s easiest to work with patterns that already have repeat patterns of some multiple of three chains. Experiment with it and if you run into problems, I’d be happy to see if a pattern could be modified. Love your video again. Now I’m really confused I have about 5 of your patterns and I don’t know which one to start first lol. Your videos are terrific and I love your voice. Thanks tens. Thank you for such a lovely and easy pattern! I’m a newbie crocheter and found this so simple. This is going to be my first afghan and I’m so excited. This no chain start is genius. This is just the thing I needed to get me started on a blanket. I absolutely love yhis pattern. Simple and vrry repetitive. Works up fadt and looks great. Aloha…I also really enjoy this pattern and have made a couple of these with the varigated yarn….with those the alternate ending worked great..
Do you think the alternate ending will work well or should I just stop at the end of the grey on top? I think it just depends on the look you would like. If you want to have the colors go to the edge, then do it without the alternate ending, but if you’d like to do a single color around the border, that will look fine as well. The video was great. I don’t think that people should be rude on this site. Thank you for the free pattern. I want to make it with a variegated thread and would like a solid white one and solid black one. You saved my life! I have been trying all day to do a granny ripple with the chain. I bet I ripped it out six or seven times, because it looked so bad! I watched the video and tried it, and it is wonderful! I am slow to start with the triples, but I am sure I will catch on! Thank you so very much! I’ve read through the pattern and watched the video, both are great! After reading the pattern several times I’m still confused about how many beginning ‘loops’ to make for each different size blanket I want to make. I haven’t done any crocheting in years but I’m confident that with your video I can make this afghan. Thank you in advance. This was so easy to figure out!!! Love it!! I have always hated trying to count long foundations chains!! Thank you!! Have fun with my project!! This made it so much easier!! Is there a width size for scarfs? 7 tr/ch spaces for 6 inches wide. 13 tr/ch spaces for 11 inches. And a Merry Christmas to you. Question. Mama is there a chart on the pattern? Yes I have watch the video and read the pattern. Thanks. I save it and printed it off. I love the no beginning projects. I wish a lot more of these were published along with along with the charts like the one you did. Your chart is excellent by the way!! I make charts upon request, so just let me know which ones you’d like charts of. I have been crocheting for just a couple of years now and have made several afghans for my grandkids and children. I have several weddings coming up this year and I am looking for crochet patterns (doesn’t have to be strickly wedding afghans). I am anxious to try out this pattern. At first look when reading the instructions, I agreed with one of your commenters…looks really hard. But after reading a lot of the comments, I am axious to try this one out. I have graduated from beginner and easy patterns to intermediate, so this one, along with the video should be easy to do. I will start out with and easy throw for myself. Also, I am looking for patterns that offer the ability to crochet into th patterns designs, such as animals and scenery. I want to crochet an afghan with a wolf howling at the moon. Any suggestions? I have done afghans like this in thee past. If you can find the picture you want, and overlay it onto graph paper, you shouldn’t have much trouble. Counted cross stitch patterns work great! You could make it in Filet style, or change colors. My lion worked great, but I’m having troubles with my JumpMan. I am always looking for patterns with no beginning chain, I love how this works up so easy. I am trying it with a bigger hook (8mm) as I am using a super chunky baby yarn, so far so good. Thank you for the pattern. Hope you will print more patterns for the no beginning chain,I am not good at changing patterns need to have printed patterns. Love this new project back to crocheting again. I am left handed and find it challenging to follow a right handed tutorial. Any suggestions? Do you know someone who could demonstrate left handed? Thank you. Have you ever tried watching videos in a mirror reflection? The Granny Ripple Afghan looks like a typical ripple afghan at a first glance. But in reality, this crochet afghan is made much like a granny square. By skipping chains and making clusters, you will achieve this ripple effect. Even though I haven’t tried the pattern yet. I believe that it is easy. I am learning to crochet. I am looking for a easy simple crochet pattern for an angel to use for a book mark, and to use for gifts. Do you have any? Mama has and can do anything. This stitch is also called “Foundation sc…foundation dc” etc. It can be used on any pattern that starts with a chain rather than a circle/round. If you can’t get the hang of it here, try googling ‘foundation sc’. I learned this a couple years ago and LOVE it. Makes working with longer chains (and short ones) so easy! Thank you so much for sharing your no chain pattern! I have used this concept before, but never had it explained so well, and so easy as you did! And all your answers and helps since are amazing. Thank you for sharing your talent and patience so generously! Can you do the no beginning chain ripple afghan in single crochet? I don’t think it would be possible with this one. The way this pattern works relies on having the longer stitches to create gaps between the stitches. I would love to make this for a queen sized bed. How many ch and treble crochet loops should I make for the width to be long enough? Thank you! I love your patterns and YouTube tutorials they are excellent! 109 spaces would make it around 90″ wide which is a good width for a queen sized afghan. I’m not sure what I did wrong but 109 spaces left me 2 extra spaces at the end of row 1. Where I should have chained 2 and did a double crochet to end. I checked and I had exactly 109 spaces and chained each row one space correctly. Did I do something wrong? I thought I should only end with one space and not two? I’d appreciate any insight you may be able to add. I’ll give you the number of the space row 2 will be worked in. Hopefull that will help sort it out. Ch 5. Without turning the work, rotate so that the following is worked across the tr created in the first row. Over first tr (space 1) work 3 dc. Work 3 dc over each of the next two tr (spaces 2 and 3). Skip one tr (space 4). Work 3 dc over each of the next two tr (spaces 5 and 6). Over the next tr (space 7) work 3 dc, ch 3, 3 dc. Work 3 dc over each of the next two tr (spaces 8 and 9). Skip one tr (space 10). Work 3 dc over each of the next two tr (spaces 11 and 12). Over the next tr (space 13) work 3 dc, ch 3, 3 dc. Work 3 dc over each of the next two tr (spaces 14 and 15). Skip one tr (space 16). Work 3 dc over each of the next two tr (spaces 17 and 18). Continue to repeat this which uses 6 spaces for each repeat, so the repeats will end on spaces 24, 30, 36, 42, 48, 54, 60, 66, 72, 78, 84, 90, 96, 102 and 108. Then you will finish off with: Over the last tr (space 109) work 3 dc, ch 2, dc. My God-daughter is expecting her first baby in July and this will be the perfect gift. Thank you so much for providing the pattern and the video. You have made it look so easy and I’m looking forward to giving it a try. Have also downloaded several of your other patterns for my TO-DO list. Thank you so much for sharing and for making it easy for those of us who are a bit challenged with the computer. Thank you so much for this pattern and the video. I have always avoided ripples because of the starting chain. I am making a blanket for my son. I just love the granny ripple. I love your patterns because I have problems with my eyes at times and this pattern is easy for me to do. I introduced my daughter to your patterns and she is in love with them also. Thank you. From a major fan. Thank you for this pattern and the video. I have been trying to crochet a ripple blanket and could never seem to do well with the traditional method. This is turning out to be beautiful and I am so pleased. Hi mama I just wanted to say thank you for this and all your patterns. They are beautiful and so easy and clear to follow. I love them and can’t wait to try them all!!! Love this pattern. I just finished a blanket and cushion for my granddaughter.